Opponents of Pennsylvania’s 40 percent tax on e-cigarettes are rallying around new legislation that would repeal what vape store owners describe as the death knell of the industry. Lawmakers and Gov. Tom Wolf avoided another protracted budget impasse this year by relying on new revenues from an expansion of gambling, reforms to the liquor system and higher taxes on smokers and the businesses that cater to their nicotine habits. That includes a 40 percent tax on the wholesale price on vaping supplies as well as a 40 percent “floor tax” on the inventory currently sitting on vape shop shelves. The “floor tax,” in particular, was seen as an insurmountable obstacle to for an industry dominated by sole proprietor operations and small businesses that can’t afford to make lump sum payments to the state. Unless the law can be repealed, Hughes said he plans to close his Fat Cat Vapor Shop in Montoursville prior to the Oct. 1 effective date of the tax. In the meantime, he’s selling off inventory at steep discounts and plans to discard whatever’s left. A pair of proposals are working their way through the state House and Senate that would eliminate the “floor tax” and replace the 40 percent tax with a tax on vaping liquid at 5 cents per milliliter. Someone who bought a 15 mL vile of liquid, for example, would pay 75 cents for the vape tax in addition to a standard 6 percent sales tax. Another House proposal would repeal the tax outright and another Senate bill would delay payment of the tax for another 90 days. “If these small businesses do decide to close and lay off workers, not only will the new vape tax revenues fall short of estimates, but the state may lose significant sales and income tax revenues,” one of the 5-cent-per-mL bills’ sponsors, Rep. Jeff Wheeland, said in his co-sponsorship memo. The Lycoming County Republican did not immediately respond to requests for comment. Here’s a look at what the budget negotiators were able to scrounge from Pennsylvania’s metaphorical couch cushions. Pennsylvania had expected to receive $13.3 million from the 40-percent e-cigarette tax, although vape shop owners said the real-world revenue would be much lower as smokers turned to online retailers and the shops shut their doors. It remains unclear how much revenue the 5-cents-per-mL tax would generate. Hughes said he opposes any tax on vape supplies — since they are used by some smokers to wean themselves off cigarettes — but believes the new bills would keep shops like his open. Supporters of the revised tax, including Hughes, have planned a rally next Monday in the Capitol Rotunda. Wheeland’s bill, which was referred to the House Finance Committee on Monday, garnered several dozen co-sponsors from both parties. House Majority Leader Dave Reed, R-Indiana County, has expressed his general support for a per-mL tax. Last week, Hughes took his efforts a step further by announcing a write-in challenge to his own lawmaker, incumbent Republican state Rep. Garth Everett. 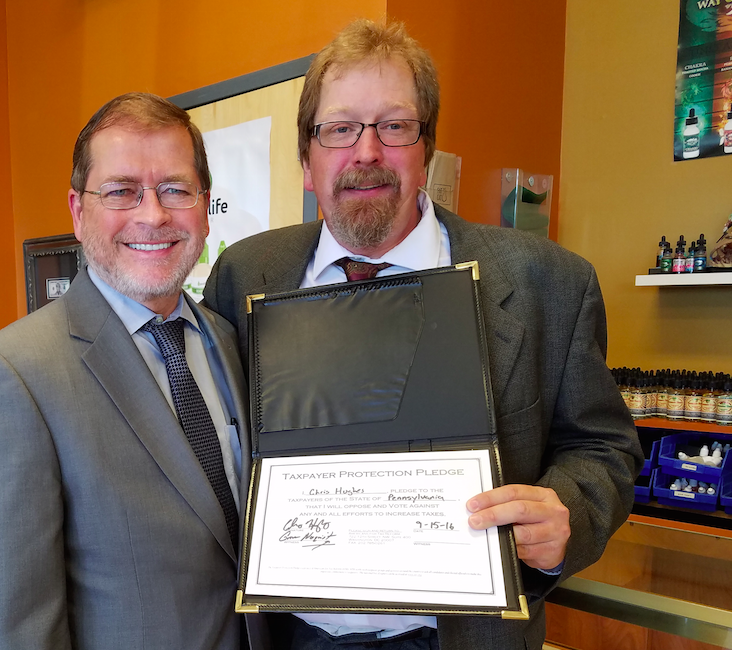 Grover Norquist, an anti-tax political advocate, spoke at an event at Fat Cat Vapor Shop. 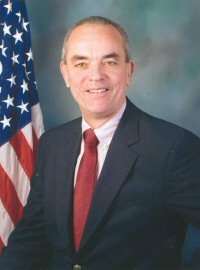 Everett, like many of his Republican colleagues, voted for the state spending bill and also voted for the revenue package. Everett, who represents parts of Lycoming and Union counties, said he would have changed a number of things about the budget if that was an option. Hughes, for his part, said he’s pledged not to raise any taxes, particularly the kinds of taxes included in this year’s budget bill that target low-income people. On the issue of a natural gas severance tax, for example, he hasn’t arrived at a firm position although he generally supports gas drilling. He’s also “satisfied” with current abortion laws, pro-gay marriage and a supporter of gun rights. Everett said he’s willing to consider any change to the vape tax that’s revenue-neutral, but he doesn’t believe Wheeland’s proposal fits that bill. A lobbyist for the Smoke Free Alternatives Trade Association said he estimated the proceeds from the per-mL tax at closer to $14 million, based on current sales. Everett also doesn’t believe as many shops will close as the owners have said. Those that do close, he said, likely were on that trajectory already. Vaping Soon To Be Included in Colorado Clean Air Act.